Residents wade through floodwaters fed by Typhoon Koppu at Zaragosa township, Nueva Ecija province, north of Manila, Philippines, Oct. 19, 2015. Philippine emergency management officials continue to urge residents to leave their homes in low-lying areas as Typhoon Koppu creeps slowly toward the country’s northwest. The storm has so far left 11 people dead, forced the evacuation of tens of thousands, and submerged entire towns. The head of the Philippines weather service predicted provinces in the west and northwest of the country’s largest island, Luzon, would experience half a month’s worth of rain in the next 24 hours. Nearly two days after Koppu arrived with 150-kilometer winds and heavy rain, Civil Defense chief Alexander Pama continued to push residents to take shelter on safe ground. Injured resident Arnel Castillo looks at the damage to his home caused by a fallen tree from Typhoon Koppu in suburban Quezon city, north of Manila, Philippines, Oct. 19, 2015. "We are encouraging everybody… for preemptive evacuation, especially those high-risk areas. We have identified and we will continue to identify the places that are most dangerous," Parma said. Koppu’s storm cloud is 600 kilometers wide, blanketing much of Luzon. It has left roof-high flooding in some towns along the overflowing Pampanga River in central Luzon's Nueva Ecija province. In other areas, rice fields have been completely submerged. Residents of mountain towns clung to rescue workers’ lifelines to navigate the fast-flowing, chest-deep brown waters. 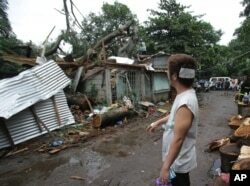 Even with warnings, some residents haven't left, Interior Secretary Senen Sarmiento said. "They are thinking of their crops. They are thinking of their animals," he said. "They are also thinking of how they will make a living, so this really is not an easy task." Koppu's strong winds have toppled power lines, cut communications and blown off rooftops. 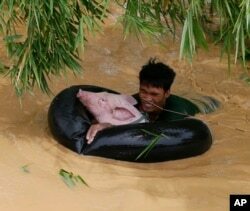 A resident uses an inflated tire interior to bring a pig to safety amidst raging floodwaters brought about by Typhoon Koppu at Zaragosa township, Nueva Ecija province, north of Manila, Philippines, Oct. 19, 2015. Close to 50 roads and bridges are impassable because of landslides, flooding or fallen trees. Electricity is out in about two dozen municipalities. On Monday, 16 flights were grounded and more than 5,000 ferry passengers were stranded at piers. The Philippine head of Catholic Relief Services said assessment teams were headed to central Luzon and would try to get inside Aurora province on the east, where Koppu first hit land. It has been a communications black hole. Koppu was not expected to directly hit the capital, Manila. Koppu is the 12th storm this year to strike the Philippines, which sees an average of 20 storms and typhoons annually. In 2013, Typhoon Haiyan, one of the most ferocious storms on record to reach land, barreled through the central Philippines, leveling entire towns and leaving more than 7,300 people dead or missing.